A parliamentary report of 1777 recorded a parish workhouse in operation at Camrose with accommodation for up to 10 inmates. County of Pembroke: Ambleston, Boulston, Brawdy, Camrose, Castle Bythe, Dale, East Walton, Fishguard (2), Freystrop, Granston, Harroldston, St Issells, Harroldston, Hasguard, Haverfordwest, St Martin, Haverfordwest, St Mary (2), Haverfordwest, St Thomas (including the Hamlet of St Thomas), Haycastle, Henrysmoat, Herbanston, Hubberston, Johnston, Jordanston, Lambston, Letterstone, Little New Castle, Llandeloy, Llanfair nant y Goff, Llangum, Llanhowel, Llanllawer, Llanrythan, Llanstinian, Llanunda, Llanychare, Llawrian, Maenor Owen, Marloes, Mathry, Morvil, Nolton, Pendergast, Pontran, Puncheston, Rock, Rudbaxton, Spittal, St Brides, St Davids (2), St Dogwell, St Edrens, St Elvis, St Ishmael, St Lawerence, St Nicholas, Steynton (2), Talbeuny, Treffarn, Usmaston, Walwen's Castle, West Robeston, West Walton, Weston, Whitchurch. The population falling within the union at the 1831 census had been 33,432 with parishes ranging in size from St Elvis (population 44) to the combined parishes of Haverfordwest (4,024). The average annual poor-rate expenditure for the period 1834-36 had been £ 11,221 or 6s. 9d. per head. 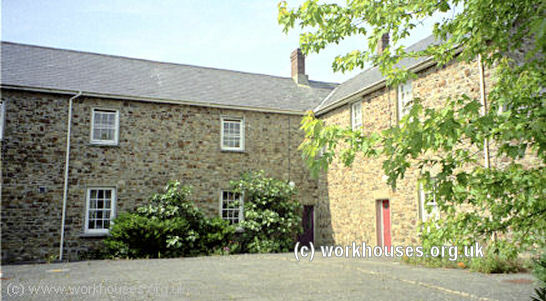 The Haverfordwest Union workhouse was built in 1837-39 at the south of Haverfordwest on an elevated site above the old Priory. The Poor Law Commissioners authorised an expenditure of £4,000 for the new building which was to accommodate around 150 inmates. 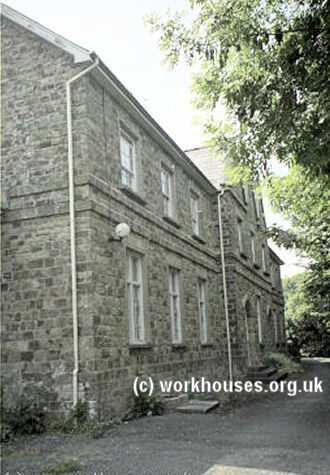 The building was designed by local architect William Owen who also designed the workhouse at the adjacent union of Narberth. Its location and layout are shown on the 1907 map below. Haverfordwest aerial view from the south-east, date unknown. Haverfordwest from the north, c.1905. Haverfordwest adopted the popular square layout with three parallel ranges linked by a central spine. Haverfordwest from the south, 2000. The entrance block at the north-east had two entrance doors — these may have been separate entrances either for males and females as at Bridgend, or for the main workhouse versus the relief office and board-room as at Pembroke. Haverfordwest entrance block from the south-east, 2000. Different categories of inmate (male/female, infirm/able-bodied etc.) were housed separately is different blocks of the workhouse. The spaces formed between the blocks were used as inmates' exercise yards. Haverfordwest yard at rear of entrance block, 2000. Unlike many workhouses of this period, Haverfordwest lacked a central supervisory hub. 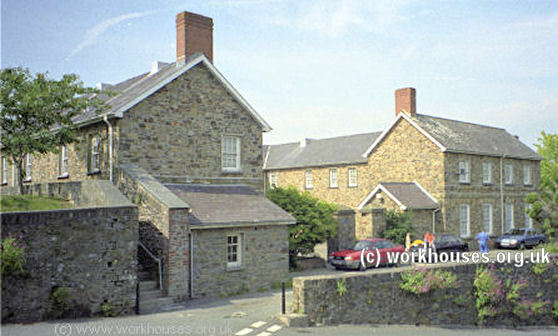 Haverfordwest rear of workhouse from the west, 2000. 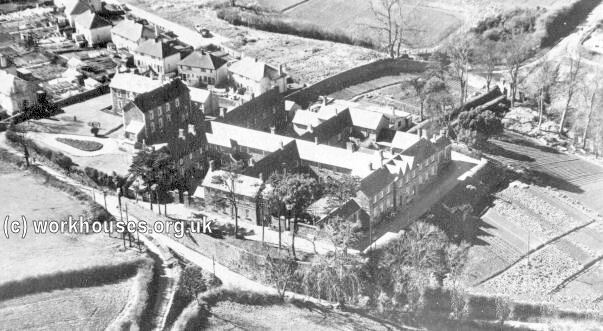 A large L-shaped infirmary block was later erected at the south-west of the workhouse. Haverfordwest infirmary block from the south-west, 2000. In 1894, the British Medical Journal set up a "commission" to investigate conditions in provincial workhouses and their infirmaries. Following a visit to Haverfordwest, the commission's report found much to criticise. The infirmary wards were small, dirty, and lacked hot water and adequate ventilation and heating; most of the patients slept on low plank beds; the toilet facilities indoors consisted of a few commodes, with one on each landing for night-time use; the water-closets, all located outdoors, were described as "simply cesspools, and some were very unpleasant." The report concluded that the workhouse infirmary "is unsuitable for its purpose, and the system on which it is worked is faulty in every particular." Further details are available in the full report. In 1930, the workhouse was renamed officially renamed Haverfordwest Institution although it was also known as Priory Mount. With with the onset of the Second World War, it came into service as a hospital. After the war, it was renamed St Thomas Hospital and was unit of the County Hospital and Withybush Hospital. It closed in 1978 and was converted into flats in 1982. Pembrokeshire Archives, Prendergast, Haverfordwest SA61 2PE. Many records survive including: Guardians' minute books (1837-1930); admissions and discharges 1878-1950 (with gaps); births and deaths (1866-1949); etc.